The 2015 Impact Grant recipients will be announced on October 29. Check out #ENFCares on Twitter to read unofficial results from Impact Grant selection meetings on October 21 and 23. For 25 business days leading up to the grand announcement, we’ll feature one of our current Impact Grant recipient’s accomplishments. 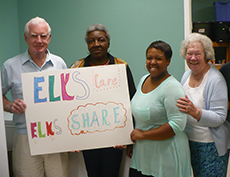 Elks are hard at work in communities across the country, donating thousands of hours to help those in need. Check back daily to learn how Elks are making a difference with Impact Grants. Together, donors, members and volunteers are working to build stronger, safer and better communities. Good news travels fast. When it is Nashua, N.H., Lodge No. 720’s turn to serve a meal at the local soup kitchen, word spreads. Up to four times a month, Elk volunteers serve food at a local soup kitchen. 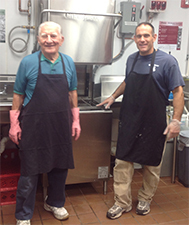 The Elks purchase, plan and prepare home-cooked meals for all those in need, which is sometimes nearly 300 people. More than 70 Elks volunteer hundreds of hours with the project, which also provides winter coats, shoes, baby supplies and more to the families, seniors and veterans who stop by for meals. Stay tuned to the Elks National Foundation website tomorrow, when we officially announce the 2015 Impact Grant recipients! Fresno, Calif., Lodge No. 439 has a passion for serving the community, and they’ve made it their mission to pass that on to the next generation. Elks partner with an alternative school to run the Mt. 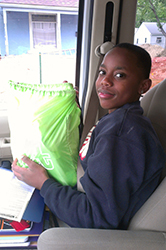 Olympus Challenge project, which teaches at-risk youth about the value of service. 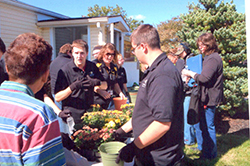 The semester-long project helps students research, design and compete to carry out a service project for the community. Students rose to the challenge, designing projects that aimed to collect hair to make wigs for cancer patients, host benefits to provide financial assistance families who’ve lost loved ones unexpectedly, and to start career assistance programs for youth in need. Elks rallied in support for the Lodge, and volunteers spent hours each week working with the students to design their projects. The mentoring paid off, and teachers report that the students enrolled in the program have better grades, better attitudes and improved performance in school. 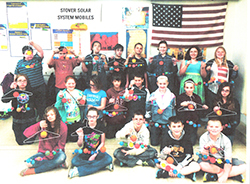 View this video to learn more about the project, and hear feedback from grateful students. For Corvallis, Ore., Lodge No. 1413, Sunday isn’t a day of rest but a day of giving. One Sunday a month, the Lodge prepares a brunch feast, and invites all those in need to attend. After serving the meal, Elks stick around to provide their guests with friendship and support. Guests are welcome to shop at the Elks General Store where they can pick up essentials like socks, underwear, and hygiene supplies. The General Store also provides seasonal support like warm winter clothes, free haircuts every few months, vision screenings, shoe vouchers and more. Santa Barbara, Calif., Lodge No. 613 partners with the veterans hospital program leaders, transitional centers, student veteran groups, nursing homes and more to ensure that veterans in the area know they can count on the Elks for support. Each month, the Lodge hosts its Peace for Veterans project, providing veterans with information, support, and a nutritious meal. Each month, the Lodge arranges seminars to help veterans with important topics such as stress relief, affordable housing, medical benefits, financial management and healthy eating. Readers of all ages are welcome in the Elks Book Club, run by Hightstown, N.J., Lodge No. 1955. Elks partner with a youth program to run the monthly club, which is geared toward pre-school children and their families. Monthly meetings include a free book for each child, a healthy meal for all in attendance, and a book reading led by the Elks. After the reading, Elks lead a discussion, play games and help some of the families with language translation. Attendance is growing each month, with as many as 40 children attending with their families each time. The project has received positive responses from all involved, including Elks volunteers. “Parents and their children have expressed gratitude—for the books, for the nutritional and educational tips we give them, and for the time and effort that the Elks are contributing to prove the educational readiness of their children,” says CIP Project Manager Bob O’Brien. For many teens, a trip to the mall is so common that it’s a cliché. 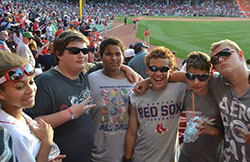 But for teens with disabilities, outings with friends are rare. Thanks to Mid-Westchester, N.Y., Lodge No. 535, these outing are becoming much more common. 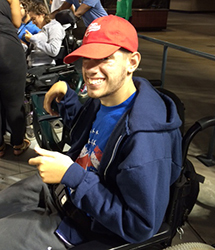 Elks partner with local organizations to organize outings for teens with disabilities, allowing them to attend movie nights, barbecues, concerts and parties with other teens. The popular outings are always booked to capacity, and have done wonders in helping the teens gain confidence to live more independently. When it comes to healthy living, dental care isn’t usually one of the first things to come to mind. However, lack of access to dental care can be a real problem for many. Thanks to the Elks at Murrells Inlet, S.C., Lodge No. 2797, community members in need have a way to remedy that problem. Elks partner with 25 local dentists to run a free dental care clinic for those in need. Each Thursday night, dentists count on the Elks to open and staff the clinic, provide and organize supplies, intake patients, help with forms, and keep the clinic moving smoothly. Their support has helped the clinic serve more than 200 patients already this year, with 100 more estimated before the year-end. Dentists depend on the Elks, whose hard work and support allows them to focus simply on treating the patients who come through the door. Soap, detergent, shampoo, toothpaste—these are things most of us take for granted. For homeless teens, these essential items can cost precious funds and make a tight budget even tighter. Thanks to the Elks of Hopkins, Minn., Lodge No. 2221, local homeless teens have a few less things to worry about. Each month, Elks pack more than 100 bags full of hygiene supplies for homeless and underprivileged youth in the community. They distribute them at 10 different food pantries, transitional centers, youth homes and shelters. Each month’s packs contain a few extra items, like school supplies in August, warm clothes in November, and Christmas gifts in December. Elks also pitch in to cook meals for the youth once a month, and invite the teens to help with Lodge service projects. Youth in need near St. George, Utah, Lodge No. 1743 have their own superheroes—the Elks. 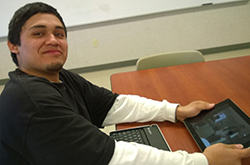 Through the Youth Success project, Elks reach out to four groups—youth in the foster care system; the children of young mothers trying to finish high school; youth expelled from or otherwise unable to attend traditional school; and high school students with specials needs, such as those who are homeless and those with disabilities. In addition to the nearly 100 Elks involved in the project, the Lodge rallies support from the community to help provide food, clothes, bus passes, baby supplies, and the simple recognition that the community cares. From providing birthday gifts to foster children to ensuring homeless students have warm clothes and blankets, these youth can count on the Elks to come to the rescue. For many students, high school graduation means college applications, job interviews, trade school or other plans. For high school graduates with disabilities, these things can be even more challenging. Thanks to Hillsboro, Ohio, Lodge No. 361, those graduates now have some extra assistance to help find their way. Elks partner with local businesses to train the teens for jobs in different fields. Elks help with skills both big and small, from job searching and interview techniques to uniform care and scheduling. This year, 27 teens attended job training programs at local restaurants, construction sites and landscaping companies. Their hard work can be seen in the landscaping at the senior center, the new mulch at the city park, in the flowers planted and sold to community members, and in a freshly painted mural downtown. Osage Community, Mo., Lodge No. 2705 takes the ‘community’ part of its name pretty seriously, by focusing on local elementary schools. The Lodge’s School First Responders project aims to create a healthier and more stable learning environment. 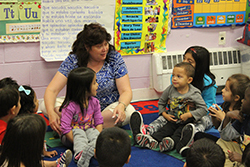 Elks visit the schools twice a month, and support students in a myriad of ways. They purchase supplies and work with teachers to plan science projects; shop for groceries for special education cooking classes; and provide emergency supplies like hygiene packs, clothes and food to keep at schools. Staff members, teachers and students have come to depend on the Elks to help them be their best. 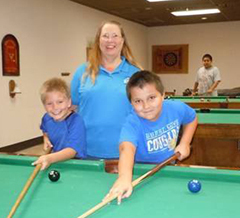 Families struggling to make ends meet now have access to increased resources, thanks to Hillsboro, Ore., Lodge No. 1862 and the Hillsboro Family Resource Center. Elks partner with the center to pack emergency food boxes; stock the onsite food pantry; purchase hygiene supplies, school supplies and baby food; and hold ongoing clothing and supply drives to provide local families with everything they need. Elks have also planted a vegetable garden, built an activity center for children to play in while their parents shop or fill out paperwork, and expanded the center’s Healthy Kids program, which teaches youth about the importance of nutrition, exercise and regular doctor visits. For more about this and Hillsboro Lodge's other grant projects, view our CIP Volunteer of the Year video about Rick Shipley. In Montana alone, more than 8,000 military members are returning from service and moving back to their communities. These veterans can count on Red Lodge ‘Beartooth,’ Mont., Lodge No. 534 to help with their transition. 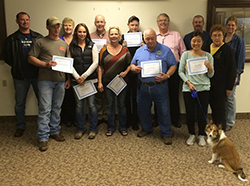 Elks partner with the Yellow Ribbon Committee to hold Veterans Education and Job Training workshops for local veterans. Veterans are invited to attend free of charge, and learn resume-writing skills, networking tips, interview techniques and more. During the two-day workshops, Elks teach classes, arrange transportation and meals, build relationships and offer support to the veterans. “One veteran has already found a new job,” says CIP Project Manager Warene Wall. “Two others were so impressed with the content that they are now encouraging others in their units to attend.” They’re not the only ones. Word has spread about the popular workshops, and Elks are receiving inquiries and invitations from neighboring states. Meanwhile, Lodge members are already hard at work planning the next event. Elks at Vincennes, Ind., Lodge No. 291 are going out of their way to ensure community members on the road to recovery have a smooth trip. Elks partner with the Life After Meth group, which helps incarcerated individuals recover from their addictions and become contributing community members. Elks began the project by renovating the facility’s library and stocking it with educational books and job-searching resources. Donations from local churches and businesses, building assistance from the residents, and strong support from the Lodge helped the project off to a quick and strong start, and helps it continue to flourish. Elks have also worked with LAM to build a mentoring program from the ground up, with 10 Lodge members as the first volunteers. For many single parents, rest and relief can be hard to come by. Thanks to Phoenix, Ariz., Lodge No. 335, Saturday mornings are now a time for new friends, great food and some extra assistance.. Once a month, as many as 35 families gather at the Elks Lodge for the Single Parent Relief project. Elks treat families to a great breakfast, entertain children with toys and games and provide every family with a big box of fresh and healthy food. Elks also arrange for educational speakers to help parents with things like budgeting and healthy cooking, keep a food pantry stocked for emergency needs, and offer families other necessities like car seats, clothes and school supplies. Elks partner with schools, churches, social services, veterans groups and more to reach out to families who may benefit from the program. Families who care for loved ones with disabilities often worry about the risk of that person losing their way. Thanks to the Elks, those families can now rest a little easier. Jonesboro, Ark., Lodge No. 498 partners with the police department to run Project Lifesaver. The project provides bracelets to those at risk of wandering, allowing them to be easily located if lost. 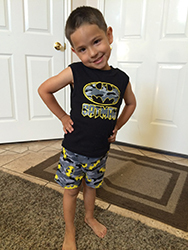 In addition to providing introductory lessons and assisting with bracelet set-up, Elks meet with the families in the program each month to provide bracelet maintenance, charge batteries, and check in on the individuals wearing the bracelets. If a community member wearing the bracelet does get lost, the Elks are on the call list right after the family and the police, ready to join the search at a moment’s notice. Last year, the Covington Food Pantry was so overwhelmed with customers that it had to turn families away. Thanks to the hard work and volunteerism of the Elks at Covington, Ga., Lodge No. 1806, the shelves are now overflowing and the workload is lighter. Elks shop for healthy staples and stock the shelves every week. By packing and distributing grocery bags to families twice a week, and rallying volunteers, the Elks have given more than a thousand hours of their time already this year. They’ve spread the word about the pantry’s good work, publish articles in the paper, and inspired local groups like the Women’s Club to lend a hand. As a result, all who come to the pantry can now walk away with enough food to sustain them, and the knowledge that the Elks are there to help. Brenham, Texas, Lodge No. 979 works hard so others can play hard. Elks partner with a local supportive living center for youth with disabilities to run the Nature Trail project. To ensure that these youth have opportunities for exercise and play, the Lodge is building an accessible nature trail, complete with sensory stations and games tailored to the needs of the youth at the center. From an audio station to a specialized interactive game built by an aerospace engineer, the trail will have something for everyone. The exciting project has gained wide support from the community, with local stores donating supplies and the Lions Club and Rotary Club lending a hand. Lodge members have responded to the project enthusiastically. When people are in need of food, they call the food pantry. But who do food pantries call when they need help? The Elks of Bristol County, R.I., Lodge No. 1860! 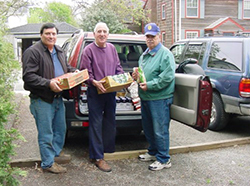 The Lodge’s East Bay Cares project supports local food pantries with emergency food baskets, deliveries of fresh produce and pantry staples, and dozens of volunteers at the ready. Lodge members new and old rally to fight hunger in the community—the food donation box at the Lodge is always full, monthly Elks-run raffles ensure the coffers stay full, and Elks stock, pack and deliver food to project partners regularly. Additionally, Elks teach cooking and nutrition classes at local pantries, focusing on healthy and affordable meals. The popular project has inspired Elks to volunteer more than a thousand hours already this year, and helped the Lodge to gain 25 members. Fighting hunger is a big challenge, but the Elks are up to it. For those who are homeless or hungry, weekends can be rough and Monday can seem a long way away. 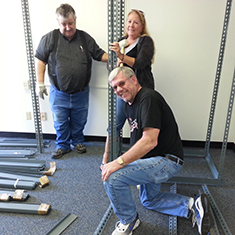 The Helping Hands project, run by Hickory, N.C., Lodge No. 1654, solves that problem by turning Sunday into a day of plenty. 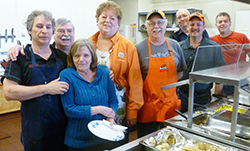 In partnership with three area churches, the Elks provide a warm meal for as many as 200 people each Sunday afternoon. Elks welcome anyone seeking a good meal, and an extra helping hand. Elks anticipate the needs of visitors and distribute clothing, toys, snack bags, toiletries and even sleeping bags to those who need it. More than 75 Lodge members have helped out this year already, and volunteers go the extra step, encouraging guests by connecting with local services, resources and programs. Elks at Augusta, Maine, Lodge No. 964 have some unexpected new friends, thanks to a partnership with the Augusta Boys and Girls Club. Elks partner with the club to run a weekly mentoring project for 25 at-risk teens. The project provides teens with caring mentors, and affords both teens and Elks new opportunities. Elk-led woodworking lessons and tutoring sessions are followed by healthy cooking classes and baseball games, ensuring there’s something to fit the interests of all teens in the program. In turn, the students convince the Elks to plan adventures like snow-tubing trips and offer Elks a new perspective. Most children—and many adults—look forward to the weekend as a time to relax and have fun. But, for children without a lot of food at home, weekends can be stressful. Morganton, N.C., Lodge No. 1852 is putting the fun back in Friday by ensuring youth have enough food to last until Monday. Elks shop, pack and deliver backpacks full of food to as many as 180 schoolchildren each Friday afternoon through their No Hunger on Weekends project. 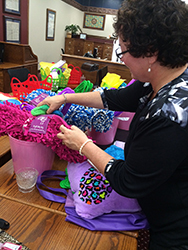 Children return the backpacks on Monday, and Elks begin the process all over again. The project started with a Beacon Grant and has grown to receive support from community churches and a high school service club. The efforts of these volunteers have paid off—since the project began, students receiving backpacks have improved both their attendance and their grades! Elks at Jackson, Ohio, Lodge No. 466 know the importance of paying it forward—or in this case rolling it forward. Through the Bicycle/Recycle Program, the Lodge promotes healthy living and offers transportation options to community members by giving away free bikes. To pay it forward, each bike recipient must volunteer at least two hours with the city’s recycling program. Community members donate the bikes to the program, which are then cleaned and repainted by students at the vocational high school, and reassembled by Elks and students at nearby Daymar College. 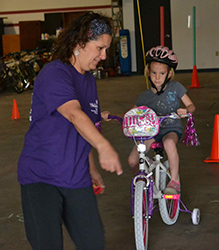 Elks distribute bikes to the community at safety fairs, bike clinics and through partnerships with the VA, the teen center and local non-profits serving people in need. Cyclists and volunteers are lining up to take part in the program. The Lodge has already given away 100 bikes, and has a waiting list of 50 more people. The poet E.E. Cummings once said, “it’s always ourselves we find in the sea.” Florida Keys, Fla., Lodge No. 1872 is hoping that a little R&R time out at sea will help veterans struggling with issues like stress and PTSD to find peace. The Lodge partners with the VA, veterans’ groups and local military bases to run their Vets on the Water project, which pairs veterans with community members eager to show their support and offer a relaxing time. From kayaking trips to fishing excursions to ecological tours, Elks are offering veterans a chance to take in the healing powers of the ocean, and have a little fun, too. Thanks to Fullerton, Calif., Lodge No. 1993’s Great Start project, dozens of girls in the foster care system have found great friends in the Elks. The Lodge runs a mentoring and support program for girls ages 12 to 18 staying in a nearby home. Elks take the girls on educational outings and theater trips, and help them celebrate their achievements. They also provide the girls with much-needed supplies such as bedding, new shoes, and welcome packages for new residents. To add a personal touch and teach the importance of charity, Elks recruit scout troops and local students to help create the care packages and choose the supplies for the girls.